Should anti-war protesters use graphic images to get public support for their cause, or will such images turn the public off? In encouraging the public to adopt sustainable behaviors, should environmental organizations ask for small changes like using fluorescent light bulbs or big changes like giving up cars? Why do most Americans say they oppose the cruel practices of factory farms and sweatshops yet still buy products from these places? And how can non-profits get more people to say yes to their requests to volunteer, donate, recycle, write a letter to a political prisoner, support gay rights, go vegetarian, conserve energy or make other positive changes? Scientific research has generated a wealth of information on how people can be persuaded to alter their behaviors, yet this body of knowledge has been largely ignored by those working to improve society. 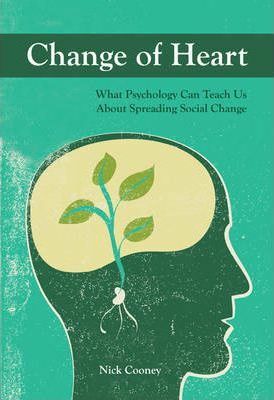 Change of Heart: What Psychology Can Teach Us About Spreading Social Change brings this information to light so that non-profits, community organizers and others can make science-driven decisions in their advocacy work. The book examines more than eighty years of empirical research in areas including social psychology, communication studies, diffusion studies, network systems and social marketing, distilling the highlights into easy-to-use advice and serving as a psychology primer for anyone wanting to spread progressive social change.